Happy September 1st friends! Well it’s happening. This week my kids go back to school and I am so not happy about it. I love having my kids home and the lazy days of summer. Why does it have to go so fast anyway? With the kids going back to school now is the time to get organized. 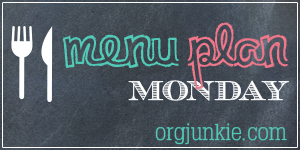 The best place to start is with a menu plan. If you still find yourself struggling with it please let me know in the comments where you find yourself getting stuck. I’ll be sure to address these concerns in future MPM posts. Also, in case you missed it, my contributor Emily shared an awesome post a couple of weeks ago called Menu Planning – Are You Making These 3 Mistakes?. I think you’ll really find it helpful. Need some help with lunch ideas? Check out this great post –> 35 Easy School Lunchbox Ideas for inspiration from A Pretty Life. Thank you for featuring the slow cooker ribs! Enjoy! Summer is never long enough. Enjoy the extra time to organize this week. I loved that post! I like meal planning, but I often take hours. I think the biggest problem for me is that I easily get bored with the same meals, so I’m constantly browsing Pinterest for new recipes. Oh thank you SO much for featuring my Back to School recipes!! I hope you have a fantastic week back! Thanks for sharing. It’s back to school and back to menu planning around here. Thanks for hosting a great party! Your recipes look amazing! Keep up the good work. We love your blog!